Visitors to Cadw sites across South Wales can explore hundreds of years of Welsh history this Easter (19 – 22 April) as the sights, sounds and smells of historic Wales return to seventeen of Wales’s most magnificent heritage properties. From Easter trails and crafts at a Cistercian abbey to Civil War re-enactments at Wales’s biggest castle, here are seven ways families can uncover Welsh history across South and Mid Wales during the Easter weekend of 2019 ― Visit Wales’s official Year of Discovery. 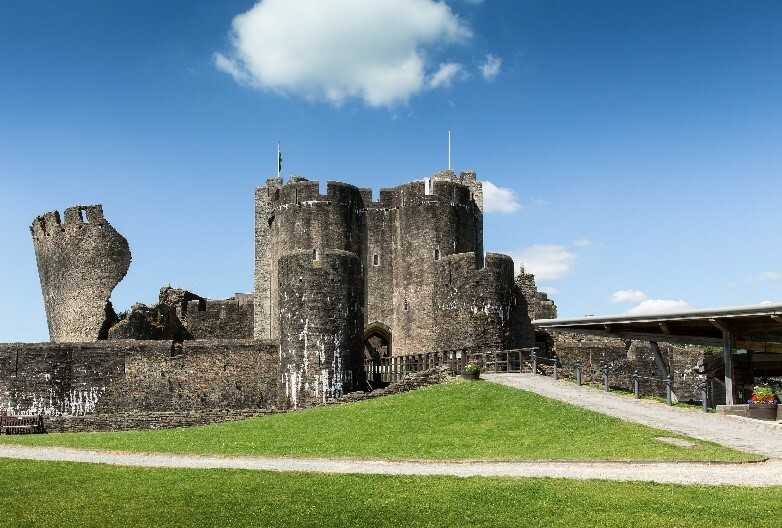 This Easter, Wales’s biggest fortress will welcome the Marquess of Winchester’s Regiment of the King’s Army for four days of battles, cannons and muskets. Visitors are advised to choose their side wisely as they witness skirmishes between the Royalists and the Parliamentarians, the changing of the guard and a host of living history activities. No booking required and normal admission fees apply. For one day only (Saturday, 20 April), Brother Thomas will give visitors a special tour of Tintern Abbey, complete with information about the monks’ rituals and responsibilities, and plenty of secrets behind the workings of the Abbey. What’s more, throughout the weekend, Abbey visitors can enjoy majestic displays with birds of prey and learn about the role of falconry in Tudor life. This Easter, visitors can experience life at Tretower Court and Castle during the 15th Century, with the chance to discover the foods people ate, how they spent their time and how they kept their swords sharp and their bowstrings dry. Those looking for a festive challenge can also join the Easter trail on Sunday 21 and Monday 22 April. Raglan Castle will march back into the 12th Century this Easter weekend, to re-enact the mingling of the Welsh, the English and the Normans. With the help of re-enactment group, Historia Normannis, visitors can expect staged battles between knights and men-at-arms, historical fashion shows, singing, historical crafts and archery. Strata Florida Abbey will help visitors put a spring in their step this Easter with a host of crafty activities on offer. Creative guests can try their hand at making cards, masks, puppets and much more. An Easter Bunny trail will also be taking place, with clues dotted around the Abbey for families to solve. Trail will be taking place all day. Normal admission fees apply. Cadbury’s Easter Egg family trail returns to Cilgerran Castle for Easter weekend. Cryptic clues will be hidden around the castle grounds, with a delicious Cadbury’s Easter Egg to reward those clever enough to solve the riddle. Normal admission fees apply but there will be a £2 additional charge per trail. Guests are invited on Sunday 21 April to hunt for clues around the castle. Those who succeed on their quest will receive an Easter egg. On Monday 22 April, the tragedy of the 1557 Oxwich Shipwreck will be brought to life through the story of Anne Mansel who met her death during the affray at Oxwich Castle. Sessions throughout the day. Normal admission fees apply. To see the full Easter events programme, please visit cadw.gov.wales/events, follow @CadwWales on Twitter and find Cadw on Facebook. Become a Cadw member at cadwmembership.service.gov.wales and gain unlimited access to over 100 historical sites from as little as £1.50 a month.